Your swimming pool pump circulates water through your pool filters. This constant circulation keeps the water clean while ensuring that the necessary chemicals are properly distributed throughout the pool – preventing algae growth. Properly maintaining your pool pump's motor extends the life of your pool pump. Certain parts of the motor, such as O-rings and bearings, benefit from periodic lubrication with a water-based lubricant. A grinding noise coming from the pump is the most common sign that your pool motor's bearing requires additional lubrication. 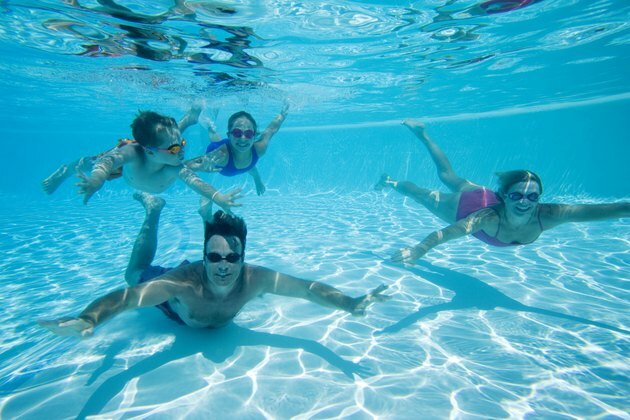 Maintain your swimming pool by keeping your pool motor in top shape. Turn off the pool pump. Turn off the circuit breaker that directs electricity to the pump. Loosen the pump's suction side and discharge side unions. Disconnect the pump from the pool's plumbing system. Move the pump to a flat surface where you can take it apart more easily. Separate the pump housing from the motor. The type of pump system you have determines how the pump housing and motor are connected. Depending on your system, you may need to use a nut driver either to remove four bolts behind the pump housing or to remove a bolt and subsequent metal clamp band to reach the motor. Pull the diffuser off the seal housing. Hold the motor shaft securely, and grip the pump impeller with a strap wrench. Turn the impeller counterclockwise with the wrench until it comes free of the motor shaft. Remove the bolts holding the pump motor onto its frame with a nut driver. Remove the motor end bells using a brass punch. Pull the motor armature out of the housing. Rub a generous amount of water-based engine lubricant on your fingers. Rub your fingers over each bearing, lubricating it well. Reassemble the pool motor and pump assembly. What Absorbs Spilt Motor Oil?